Indispensable for the koi keeper. Bowls will allow you to properly view your fish and also apply treatments. Blue plastic koi bowl for the inspection and treatment of your fish. Every koi keeper should have a couple of adequately sized bowls. 22" diameter, 9" deep. 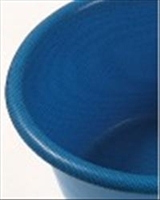 Blue plastic koi bowl for the inspection and treatment of your fish. Every koi keeper should have a couple of adequately sized bowls. 24" diameter, 10" deep. Blue plastic koi bowl for the inspection and treatment of your fish. Every koi keeper should have a couple of adequately sized bowls. This Flexi-Bowl is designed for the temporary storage of fish and pond plants. Holds approx. 380l. Description: 0.9m diameter, 0.6m deep. Mesh cover with zipper. NB. The bowl is not 100% water tight so there may be some small leakage. This does not matter as the leakage is minimum or you can improve it by using the included spares. Spares Included: 1 Piece wax; 2 Pieces spare cloth; 5 spare end caps. 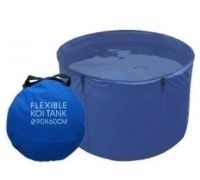 This Flexi-Bowl is designed for the temporary storage of fish and pond plants. Holds approx. 650l. Description: 1.2m diameter, 0.6m deep - mesh lid with zipper. Spares Included: 1 Piece wax; 2 Pieces spare cloth; End Caps 5 pieces. Keep up to date with news & Pond Advice. CLICK HERE. You can call us Monday - Saturday on 028 70825213 or 07770 802636. Copyright © 2014 Causeway Koi. All Rights Reserved. Built with Volusion.